Beautiful high quality boutique clothing outfit for girls this Fall/Spring/Winter. [PLEASE READ] TRUE TO SIZE. Please choose the SIZE your girl usually wears. DO NOT refer to AMAZON's General Size Chart. Size 2T is for average 2-3 year-old girls. Size 3T is for average 3-4 year-old girls etc...If she is in between SIZES, choose the bigger size. For size 5 and up, you can go up 1 size if your girls is tall/big. Outfit you receive will have alphabetical size tag that is equivalent to the numeric size you chose. 2 Piece capri set. 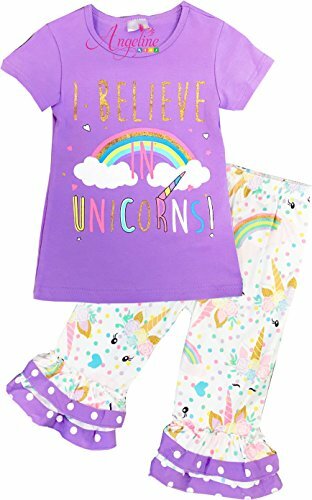 Soft cotton unicorn capri bottoms and a matching lavender top with "I Believe In Unicorns" written on the front. So comfortable for everyday wear and super stylish. 97% cotton & 3% spandex. Exclusive of decoration. Soft and high quality material. Comfy for all day wear in this Fall/Winter holiday time.